Unique as the North, a ground-breaking partnership points to a model for future resiliency across the North and beyond. The Missanabie Cree, the Chapleau Cree, and the Netamisakomik Anishinabek (Pic Mobert) First Nations are now significant owners in two Hornepayne businesses. 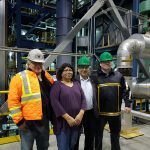 Having partnered through the newly formed Northeast Superior First Nation Investment LP, the three First Nations now hold a $4 million equity share in Hornepayne Lumber and Hornepayne Power Inc.